Piccolino captures the spirit of Italy with its great food, unrivalled style and vibrant, charming character. 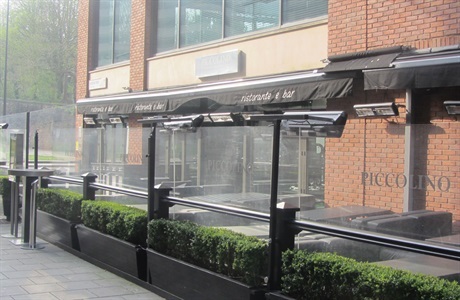 Located in the striking Quakers Friars, Piccolino boasts an equally eye-catching exterior, together with a delightful al fresco terrace that is the perfect place to take a break from shopping and enjoy a relaxing drink or bite to eat with friends. Once inside the restaurant, the vibrant green leather upholstery, striking black marble tabletops and sleek wooden finishes ensure a contemporary style and bold design with a smart yet informal atmosphere. Meanwhile, chefs work in the open kitchen, creating every dish with care and precision, whilst the sight of fresh pasta being made from scratch is a charming spectacle for guests to watch as they enjoy the great flavours of Italy. Piccolino’s private dining room is located on the upper floor of the restaurant and provides guests with the opportunity to enjoy a great tasting experience in the privacy of their own room. Seating up to 20, it is the perfect setting for a number of private functions, from birthday parties to business events and intimate dinner parties.